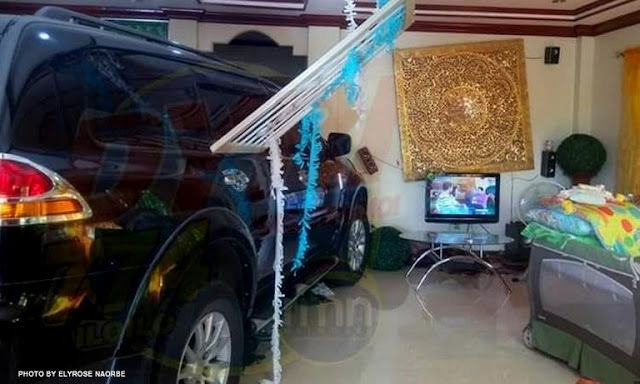 ILOILO City, Philippines- A family driver in Iloilo City has reported another case of sudden unintended acceleration (SUA) in Mitsubishi Montero Sport on Monday, December 7 inside a house in Monte Rosa Subdivision in Mandurriao, Iloilo. According to Gregorio Deloeste, he experienced SUA while he was about to park the 2012 automatic transmission Montero Sport in the garage of the family home. Although Deloeste shifted the gear stick to neutral and applied the handbreak, the vehicle still mysteriously accelerated plowing through the living and dining area of the house. “Bigla na lang nag-rebolusyon nang malakas, 'di na siya makontrol. Inapakan ko ang preno,” Deloeste told GMA News. The SUA incident caused damage to the house destroying several appliances and furniture. Part of the house’s ceiling also collapsed. Luckily, no one was harmed by the incident. Prior to the incident, Deloeste claimed that the vehicle was subjected to a computer test and proved to be in good condition. Following the SUA case, Allan Palacios, the Mitsubishi Montero Sport car dealer in Iloilo City, immediately inspected the crash site. After conducting an investigation on Thursday, December 10, Mitsubushi Motors Corporate Communications Senior Manager Arlan Antonio Reyes said that they have not found anything wrong with the vehicle. “Kung tama ang pagmamaneho ninyo hindi kayo ma aaksidente,” Reyes added. Despite several reported incidents of SUA, an official statement from Mitsubishi Motors Philippines Corp. (MMPC) claims that Montero Sport is neither defective nor unsafe to use. Stating that MMPC has conducted extensive investigation and testing of units with SUA complaints, the company says that no defect of malfunction had been observed linked to SUA.